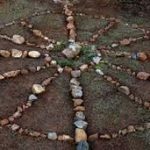 Medicine Wheels are powerful meditation tools that help us connect with our inner selves, the middle, upper and lower worlds and the spirit of all that is. Medicine Wheels are usually made with stones or crystals that have been collected and gathered with dedication and purpose. Some Medicine Wheels are constructed on altars and small healing tables, and become attuned to the person who interacts with them for meditation, healing and energy alignment. Most Medicine Wheels are built and energised on the land, so that people can interact with them and perform rituals at the solstice and equinox; and meditate, and sit in them throughout the rest of the year. – Help us connect to all beings in the natural world. – Medicine Wheels also link us to the energies of the cosmos and stars! Spending time in Medicine Wheels can help us in our daily life, as we connect to the Earth and align to the energies of the cosmos. It can also bring a sense of peace and connection that helps reduce stress and anxiety, as it teaches us about the cycles of life that help us nurture ideas and projects; while helping us recognise that everything has a time of growth as well as a season of reflection and renewal. When Medicine Wheels are created with a sense of purpose and dedication, the people who interact with them live a more balanced, healthy and connected life. As the June Solstice approaches why not make a Medicine Wheel on your land or altar. You can dedicate it to your own needs and your unique journey. As you construct the Wheel, think about your own personal purpose at this time, and ask any and all helpers in the invisible realms to add their energies and influence to it as well. When you create it, start in the east and work round the circle (read here to learn more) – infusing it with your own energies, thoughts and dreams. Then when the Solstice happens on the 21st June at 8.07pm EST, you will have a Medicine Wheel – a sacred space – that is ready for you to connect with, to help you align with your sacred I AM Presence, as well as the beautiful soul of this planet and her relationship with the stars. This entry was posted in Blog and tagged activating the christ grid, christ consciousness in the land, connect with mother nature, create a medicine wheel for the equinox, create a medicine wheel to help you honour the Solstice, earth and soul consciousness, earth consciousness, earth wisdom, how to make medicine wheels, land healing, land rituals and stone circles, loving the Earth, native american medicine wheels, spiritual awakening, tools to connect with the Earth. Bookmark the permalink.